Download "Achieving customer loyalty with customer analytics"
2 2 Achieving customer loyalty with customer analytics Contents 2 Overview 3 Using satisfaction to drive loyalty 4 Customer analytics for customer loyalty 5 Areas of effectiveness 6 IBM Business Analytics solutions for customer loyalty 7 Conclusion Overview For reasons both traditional and contemporary, achieving customer loyalty is an essential capability in today s fast-moving marketplace. Businesses have long known that it is more cost-effective to retain a satisfied customer than to attract a new one. And that a loyal customer is a strong competitive advantage because of the recurring potential for additional revenue. But today s customers are more empowered, better informed and more likely to switch to a competitor at a moment s notice. For those that are able to build strong customer relationships in this age of social media and instant information, the rewards can be substantial. Loyal customers not only provide you with their valuable business, but often share their enthusiasm with their peers online. According to a Forrester Research study, being a Facebook fan of the electronics chain store Best Buy increases the likelihood of that customer making an actual purchase there by more than 500 percent. A loyal customer has the potential to bring greater value to your organization than ever before. 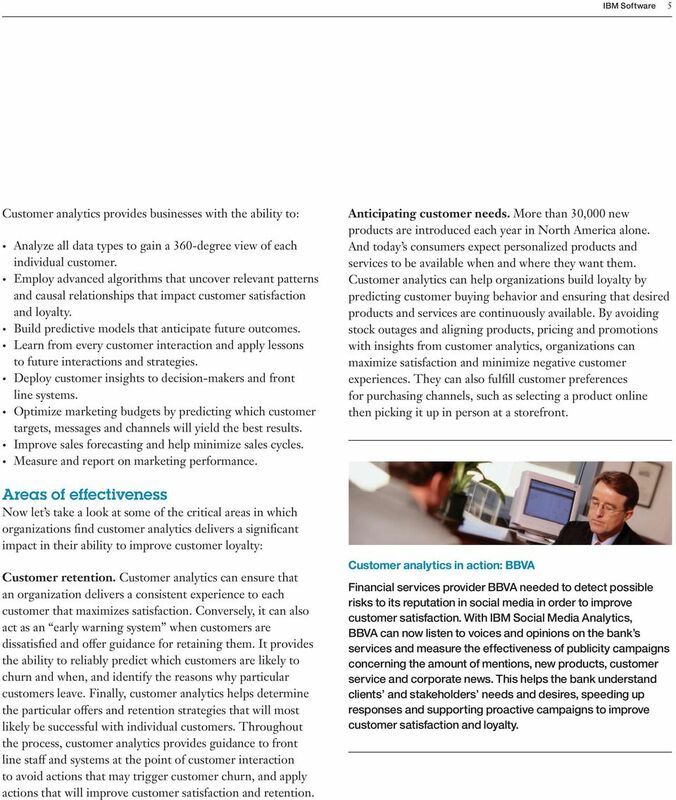 3 IBM Software 3 In this white paper, you ll learn how organizations like yours are using customer analytics to build and sustain customer loyalty. Customer analytics helps answer key questions about who your customers are, what they want and will do next, and which actions and strategies are most likely to generate loyalty. It s a powerful and innovative technology, but still operates on the traditional business axiom that customer loyalty begins with customer satisfaction. Using satisfaction to drive loyalty According to recent IBM studies of leading companies around the world, the number one priority for CEOs is to engage customers as individuals, and the number one priority for CMOs is to enhance customer loyalty. Their focus is on getting closer to the customer, and achieving loyalty through their ability to satisfy those customers. But in order to satisfy customers, an organization must first be able to understand, anticipate and fulfill customer needs and preferences. They must know: How to reply to someone through social media. The potential causes for satisfaction and dissatisfaction. Why and when customers are likely to leave for a competitor. How to accurately measure a customer s lifetime value. What actions will prevent at-risk customers from leaving. How to satisfy and increase the profitability of their most valuable customers. How to align their operations so every customer interaction increases satisfaction. In order to differentiate themselves, businesses can no longer compete purely on product/service quality or price. They must gain a deep understanding about a wide range of variables that affect customer satisfaction. Factors such as personalization of services, preferences for how they would like to be contacted, the ability to get the right person on the phone to or get questions or issues resolved quickly and easily, and many others build the foundation for customer satisfaction. There is an enormous amount of customer information that must be tracked, analyzed and acted upon in order to build loyalty and gain an edge on the competition. Customer analytics in action: XO Communications Telecommunications provider XO Communications needed a way to identify and understand customers who were at risk of leaving for a competitor, and take action to retain them. Using IBM customer analytics, XO was able to significantly improve customer retention and increase profitability. In the first year after implementing the IBM solution, the company reduced customer churn by 8 percent. In the second year, customer churn dropped by 18 percent. It s estimated that XO achieves an annual benefit of nearly 4 million dollars due to its customer analytics solution. 4 4 Achieving customer loyalty with customer analytics Customer analytics for customer loyalty Many successful companies now rely on customer analytics as the means to harness the volumes of customer information that can affect loyalty and satisfaction. Customer analytics provides the ability to not only extract critical insights from that data, but also to embed it within front line customer interactions, business processes and operational systems. In this way it helps to align internal operations so the customer experience is consistently optimized across the entire enterprise. In addition to answering the critical questions mentioned above, forward-looking organizations are using customer analytics to: Guide front-line interactions with customers. Create and execute customer retention strategies. Prompt people or systems to proactively address customer satisfaction issues. Guide product planning to fulfill future customer needs. Hire and train employees to act upon customer insights and improve loyalty. Align their operations to focus on satisfying customers. Customer analytics in action: PhotoBox PhotoBox, a European leader in digital photo printing, uses IBM customer analytics to better understand its customers and build loyalty by increasing satisfaction. Through improved targeting and profiling of customers, PhotoBox achieved a 94 percent satisfied with purchase rating from customers. It also substantially increased customer loyalty, with unsubscribe rates falling to 0.6 percent. In addition to gains in customer loyalty, IBM customer analytics also helped the company increase sales by 30 percent in one year, compared to an increase of less than 10 percent for its competitors over the same time period. So what is customer analytics and how does it work? In the most basic sense, customer analytics is made possible by combining elements of predictive analytics and business intelligence software. It uncovers patterns and trends in customer behavior and sentiment hidden among different types of customer data such as transactions, demographics, social media, surveys and interactions. The results of that analysis are then used to predict future outcomes so businesses can make smarter decisions and act more effectively. The results of customer analytics initiatives are then measured and delivered back to decision-makers through reports, scorecards and dashboards. Self-learning predictive models ensure that each new iteration of customer analytics insight and the business decisions it drives become more accurate and effective. 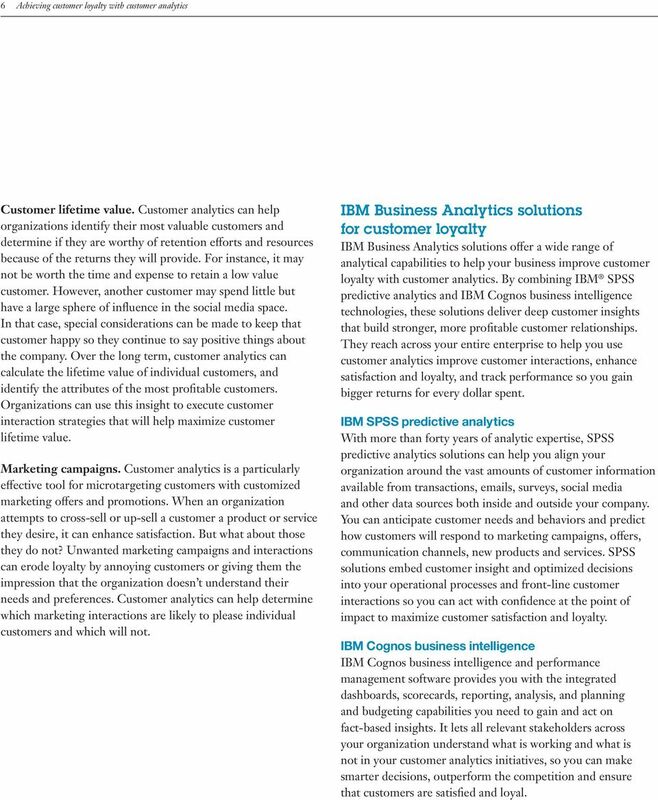 5 IBM Software 5 Customer analytics provides businesses with the ability to: Analyze all data types to gain a 360-degree view of each individual customer. Employ advanced algorithms that uncover relevant patterns and causal relationships that impact customer satisfaction and loyalty. Build predictive models that anticipate future outcomes. Learn from every customer interaction and apply lessons to future interactions and strategies. Deploy customer insights to decision-makers and front line systems. Optimize marketing budgets by predicting which customer targets, messages and channels will yield the best results. Improve sales forecasting and help minimize sales cycles. Measure and report on marketing performance. Areas of effectiveness Now let s take a look at some of the critical areas in which organizations find customer analytics delivers a significant impact in their ability to improve customer loyalty: Customer retention. Customer analytics can ensure that an organization delivers a consistent experience to each customer that maximizes satisfaction. Conversely, it can also act as an early warning system when customers are dissatisfied and offer guidance for retaining them. It provides the ability to reliably predict which customers are likely to churn and when, and identify the reasons why particular customers leave. Finally, customer analytics helps determine the particular offers and retention strategies that will most likely be successful with individual customers. Throughout the process, customer analytics provides guidance to front line staff and systems at the point of customer interaction to avoid actions that may trigger customer churn, and apply actions that will improve customer satisfaction and retention. Anticipating customer needs. More than 30,000 new products are introduced each year in North America alone. And today s consumers expect personalized products and services to be available when and where they want them. Customer analytics can help organizations build loyalty by predicting customer buying behavior and ensuring that desired products and services are continuously available. By avoiding stock outages and aligning products, pricing and promotions with insights from customer analytics, organizations can maximize satisfaction and minimize negative customer experiences. They can also fulfill customer preferences for purchasing channels, such as selecting a product online then picking it up in person at a storefront. Customer analytics in action: BBVA Financial services provider BBVA needed to detect possible risks to its reputation in social media in order to improve customer satisfaction. With IBM Social Media Analytics, BBVA can now listen to voices and opinions on the bank s services and measure the effectiveness of publicity campaigns concerning the amount of mentions, new products, customer service and corporate news. This helps the bank understand clients and stakeholders needs and desires, speeding up responses and supporting proactive campaigns to improve customer satisfaction and loyalty. 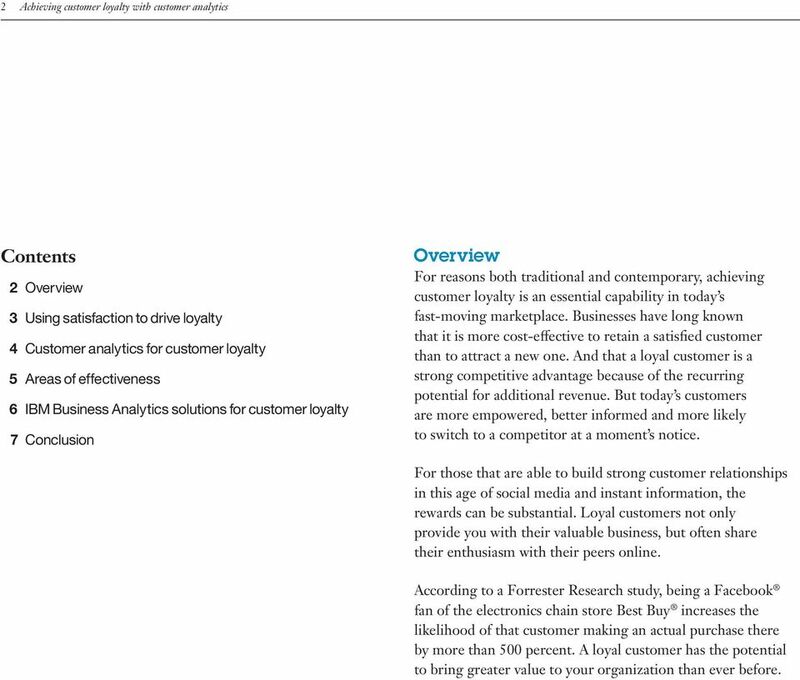 6 6 Achieving customer loyalty with customer analytics Customer lifetime value. Customer analytics can help organizations identify their most valuable customers and determine if they are worthy of retention efforts and resources because of the returns they will provide. For instance, it may not be worth the time and expense to retain a low value customer. However, another customer may spend little but have a large sphere of influence in the social media space. In that case, special considerations can be made to keep that customer happy so they continue to say positive things about the company. Over the long term, customer analytics can calculate the lifetime value of individual customers, and identify the attributes of the most profitable customers. Organizations can use this insight to execute customer interaction strategies that will help maximize customer lifetime value. Marketing campaigns. Customer analytics is a particularly effective tool for microtargeting customers with customized marketing offers and promotions. When an organization attempts to cross-sell or up-sell a customer a product or service they desire, it can enhance satisfaction. But what about those they do not? Unwanted marketing campaigns and interactions can erode loyalty by annoying customers or giving them the impression that the organization doesn t understand their needs and preferences. Customer analytics can help determine which marketing interactions are likely to please individual customers and which will not. 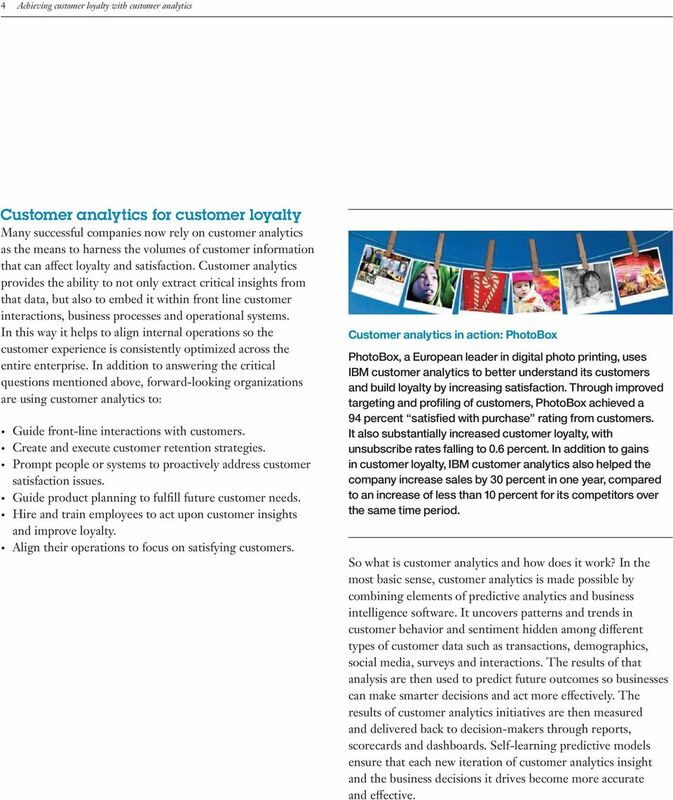 IBM Business Analytics solutions for customer loyalty IBM Business Analytics solutions offer a wide range of analytical capabilities to help your business improve customer loyalty with customer analytics. By combining IBM SPSS predictive analytics and IBM Cognos business intelligence technologies, these solutions deliver deep customer insights that build stronger, more profitable customer relationships. They reach across your entire enterprise to help you use customer analytics improve customer interactions, enhance satisfaction and loyalty, and track performance so you gain bigger returns for every dollar spent. IBM SPSS predictive analytics With more than forty years of analytic expertise, SPSS predictive analytics solutions can help you align your organization around the vast amounts of customer information available from transactions, s, surveys, social media and other data sources both inside and outside your company. You can anticipate customer needs and behaviors and predict how customers will respond to marketing campaigns, offers, communication channels, new products and services. SPSS solutions embed customer insight and optimized decisions into your operational processes and front-line customer interactions so you can act with confidence at the point of impact to maximize customer satisfaction and loyalty. IBM Cognos business intelligence IBM Cognos business intelligence and performance management software provides you with the integrated dashboards, scorecards, reporting, analysis, and planning and budgeting capabilities you need to gain and act on fact-based insights. It lets all relevant stakeholders across your organization understand what is working and what is not in your customer analytics initiatives, so you can make smarter decisions, outperform the competition and ensure that customers are satisfied and loyal. 7 IBM Software 7 IBM Social Media Analytics IBM Social Media Analytics is an analytics application designed specifically for social media. It uses sophisticated software to assess the volume, sentiment and trends in consumer conversations across a wide range of social media sources. You can use this information to guide your organization s customer loyalty strategies to be more precise, agile and responsive to consumer demands, allowing you to target or calibrate marketing campaigns and customer interactions to grow market share, enhance reputation and improve customer satisfaction. Conclusion The ability to create and sustain customer loyalty is a critical capability for organizations. Faced with informed and empowered customers, and massive volumes of readily available customer data, businesses need a way to align their staff and operations to ensure customers are satisfied. 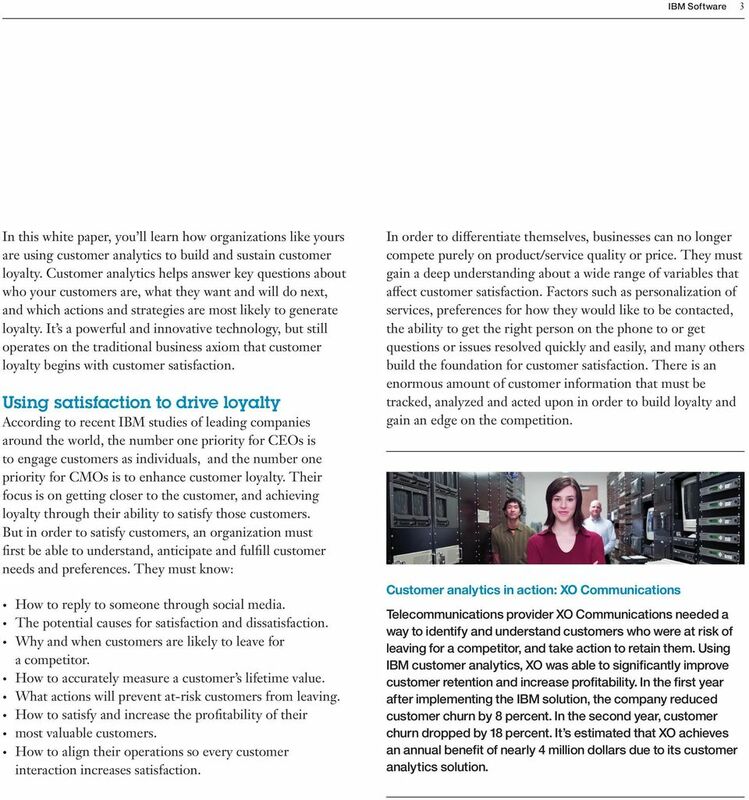 IBM solutions for customer loyalty help organizations use customer analytics to gain actionable insights from customer data, and deliver those insights to the people, processes and systems that can improve customer satisfaction and loyalty. 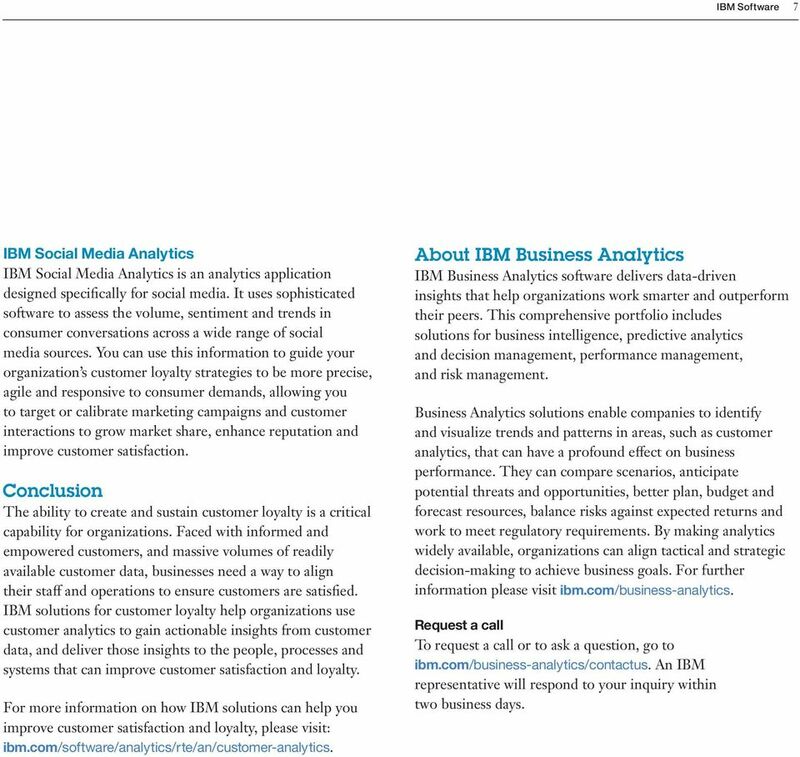 For more information on how IBM solutions can help you improve customer satisfaction and loyalty, please visit: ibm.com/software/analytics/rte/an/customer-analytics. About IBM Business Analytics IBM Business Analytics software delivers data-driven insights that help organizations work smarter and outperform their peers. This comprehensive portfolio includes solutions for business intelligence, predictive analytics and decision management, performance management, and risk management. Business Analytics solutions enable companies to identify and visualize trends and patterns in areas, such as customer analytics, that can have a profound effect on business performance. They can compare scenarios, anticipate potential threats and opportunities, better plan, budget and forecast resources, balance risks against expected returns and work to meet regulatory requirements. By making analytics widely available, organizations can align tactical and strategic decision-making to achieve business goals. For further information please visit ibm.com/business-analytics. Request a call To request a call or to ask a question, go to ibm.com/business-analytics/contactus. An IBM representative will respond to your inquiry within two business days. Voice. listen, understand and respond. enherent. wish, choice, or opinion. openly or formally expressed. May 2010. - Merriam Webster. www.enherent.